2011 CDS Holiday Fair! Thank you! You are here: Home » Blog » 2011 CDS Holiday Fair! Thank you! We brought in over $4,000 from the Holiday Fair! We will be purchasing new playground equipment this break. This money will also help to fund our AR celebrations and IXL rewards. 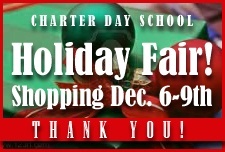 Thank you for participating in our Holiday Fair! Sarah Gardinor and Aaron Bernecker’s work 4 years in a row provide a value- added opportunity for our students to purchase gifts at a reasonable price, while raising money for the Booster Club. This was accomplished through the organization of many parent volunteers: Thank you Melissa Brown, Steven Pritchard, Melanie Sevier, Kimberly Harp and Jacqueline Malpass.